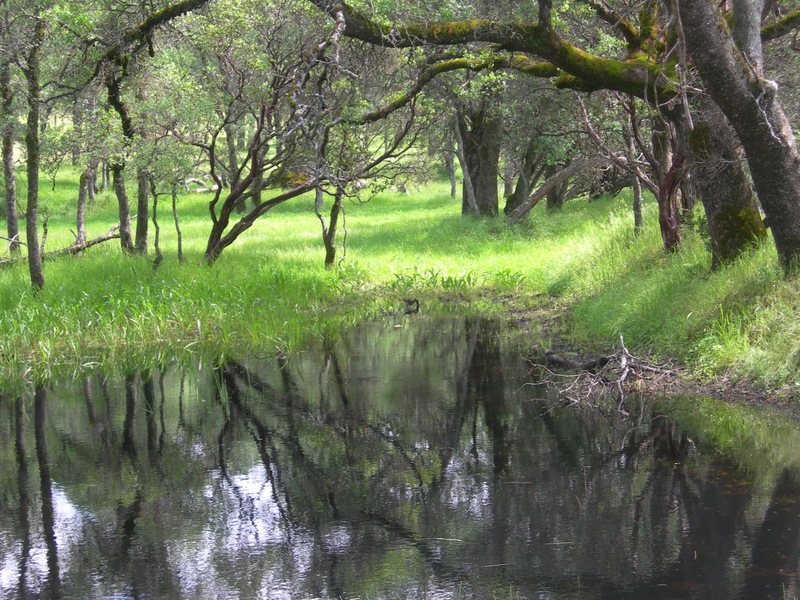 This is a vernal pond, a few miles from my home. It will fill with water by Christmas and be dry again by Easter. Let’s take a break from the world of politics and check into the latest meteorological phenomenon. That may not be a big deal to you, but here in the foothills of the Sierras it represents the change from one season to another in a climate that only has two seasons – dry and wet. Our last rain came in mid-April. Six months without a drop. You may have heard that we are in a drought, but this is a different phenomenon. It is normal here for the last rain to come in mid-April, and normal for the first rain of the rainy (if that is the word) season to come in mid-October. Our drought is because we haven’t been getting enough rain between October and April. So what does that have to do with my world of writing science fiction? Everything, really. When I was young, my three favorite SF authors were Clarke, Heinlein, and Norton. Clarke’s stories always took place in artificial environments. Heinlein’s characters inhabited space ships, orbiting habitats, or frontier worlds; it didn’t matter, as long as they could talk incessantly, they were happy. Andre Norton characters, whether they were explorers, soldiers, spies, or interstellar traders, always spent their time outdoors, in wilderness or something like wilderness. The only cities you were likely to see in a Norton novel were in ruins, or the slums of the Dipple which any one of several young men were quick to flee from, usually into more trouble than they could imagine. That suited me just fine. Her worlds were my world. In rural Oklahoma, I spent from May to September every year outside, usually driving a tractor, through rain, wind, dust, and heat. There were years when I watched the crops dry up and die under the relentless sun – and watched my Dad see six months work disappear before his eyes. There were other years when the rains came on time, the crops were good, and the pastures grew up heavy with grass; when the nights were a symphony of insect whirrings and the days were filled with bird songs and butterflies. Cliché? Paradise always sounds like a cliché. It was the only life I knew, and I loved it, good years and bad, but I had to leave it, first for college, then to make a living. When I wrote my first book, I sent my protagonist into the mountains and lost him there, then let him find his way out. For my second book, Jandrax, I marooned a shipload of colonists on a barren, unexplored world, and watched them find a way to survive. In Cyan, coming out in a few months, I send a crew of ten to explore a rich new planet, then send them back to colonize. I lived in a small city for most of my life. I could write about cities, but I don’t want to. My world is the world of nature – even if it is nature on another planet. So— it rained last night. About an inch, which isn’t much, even by Oklahoma standards, but the foothills only get thirteen inches in an average year. All the creekbeds remain empty and the hills remain covered with tall, dead grass in shades of brown, but within the soil, the change has begun. Seeds that have lain dormant since spring will be sprouting now, out of sight, and within a week there will be a faint haze of green, invisible beneath the long grass, but showing in the road ditches. This year’s grass will begin to flex its vegetive muscles, forcing its way upward through last year’s dead roots. Unnoticed, those roots will begin to loosen and be shoved aside until one day, a month from now, seemingly all at once, the old year’s grasses will tilt and fall, to disappear beneath the new green. Suddenly all the brown will be gone and the new year’s grass will clothe every hillside. While the snows of winter cover the midwest, these Sierra foothills will be spring green, and the wildflowers will return. This entry was posted in A Writing Life and tagged Andre Norton, ecology, memoir, science fiction, seasons, writing on October 18, 2016 by sydlogsdon.